Looking for Virginia Beach hotels? Do you want to overlook the ocean? I've got reviews of hotels that are on the Boardwalk, family-friendly, and full of amenities. Plus, I'll tell you which hotel you might want to AVOID. Keep reading below and I'll give you tips for getting a great hotel rate. Scroll down for a great resource from HotelsCombined. This site allows you to search hotel rates from multiple online booking sites at the same time so, you'll be sure to get a great deal on Virginia Beach hotels. For rock-bottom last-minute hotel room deals, check out my "How to Get a Great Rate" Tips. Hotels Combined deals - One of my favorite sites for getting a great hotel deal. Click here to look up a great hotel deal for you. Choice Hotels Special Deals - They have golf, romance, and stay & fly packages, AARP deals, and deals that will earn your up to 50,000 bonus points...plus a limited time stay two times get a free night free deal. For details, go to www.choicehotels.com. Orbitz deals - For their latest promo code deals and discounts, plus last-minute hot deals, go to Orbitz.com. Specials at Siebert Realty - Get away from it all with these Virginia Beach rental deals from one of the best, most-reliable VB rental sources. Go to www.siebert-realty.com. Expedia Deals - The online giant regularly offers deals that can save you 35%, 50% or more on hotels and flight plus hotel vacations. Go to expedia.com. Wondering how to make your vacation dollar stretch? How about a well-deserved vacation for less in Virginia Beach hotels? Enjoy both Virginia Beach and Busch Gardens Williamsburg with this package deal. The package includes two nights oceanfront accommodations and a one day ticket to Busch Gardens. Package prices start at $98.00 per person, based on double occupancy. Call (800) 344-3342 for details. Here's a pampering package at the Beach Spa Bed & Breakfast good for a honeymoon, anniversary, or just general romance. It includes a two-night stay, a wine welcome reception, a Salt Water Taffy turn down, two multi course gourmet breakfasts daily, two Entrées at a top rated restaurant, a couples massage, heated spa pool, and a heated massage water fall. Rates start around $275. For details, call (757) 422-2621. 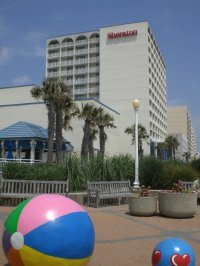 One of the family-friendliest Virginia Beach hotels, the Holiday Inn Sunspree often offers Staycation Deals. One recent package, which started at $239, included 5 nights oceanfront accommodation with a king sized bed and a sofa sleeper, breakfast each day, and use of amenities including a 50-seat Movie Theater, Kids Klub, Splish Splash Lagoon, and fitness center. In the summer, they usually have a 3-night stay deal, a Pizza Family Getaway, and more. Call 757-428-1711. December through March, go on an adventure of a lifetime with a whale-watching package starting at just $83 per person. Packages include: Two nights accommodations, a whale-watching excursion, tickets to the Virginia Aquarium, an IMAX movie, and even breakfast! 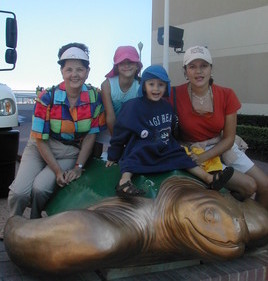 Check out our Whale Watching Packages page for details. Celebrate your special event with this romantic package at the Oceanfront Inn. Includes a gourmet basket with wine glasses, a bottle of Williamsburg Winery Acte 12 Chardonnay, and gourmet chocolates by Schakolad Factory. Minimum 2 night stay. Prices: $139.00 - $419.00 plus tax per couple. Call 888-826-2326 for details. Visit off-season and you'll get amazing rates at this oceanfront inn that includes free deluxe continental breakfast with hot waffles. Oct-Dec rates start at $49-$59 for 1-2 people. For details, call 757-428-1183. One way to save on Virginia Beach hotels costs is to stay where kids eat free. Both Holiday Inn and Marriott offer kids eat free deals, although the the Marriott deal has more restrictions. At Holiday Inns, kids under 12 always eat free with a paying adult. 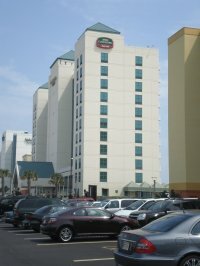 Examples are the Holiday Inn Sunspree at Virginia Beach, and the Holiday Inn Hotel and Suites Williamsburg. At certain Marriotts, you can book an Escape Family Time Package which also lets kids 12 and under eat free with a paying adult, plus throws in a free in-room pizza party. However, availability varies significantly by date and location. Book early: Don't wait until the last minute. Call Virginia Beach hotels directly as early as possible; they may be willing to give you a good rate in order to lock in a reservation. Call back: Call back 24-72 hours before you arrive at Virginia Beach hotels. If the rate has dropped, you can usually rebook at the lower rate. Ask for the lowest rate at Virginia beach hotels:Don't assume you're getting a good quote! Ask for the lowest rate or the corporate rate (usually the lowest rate they can offer). You don't have to be on business to get it. Try AAA: If you have AAA, always ask for the AAA rate. It's usually good for saving $5-$10 per night or more. FIND COUPONS! : They may not be easy to find unless you know where to look. Luckily for you, I do! For example, Roomsaver.com offers coupons--good for walk-ins only-- that can get you an oceanfront room for as little as $39.95 per night in the off-season! Shop multiple sites: This can be time-consuming. That's why I like onsite rate-finders like www.sidestep.com or www.hotelscombined.com which check multiple sites at once. Click here for info on dirt-cheap hotel deal?